There is nothing better than a slow cooker on a busy day. 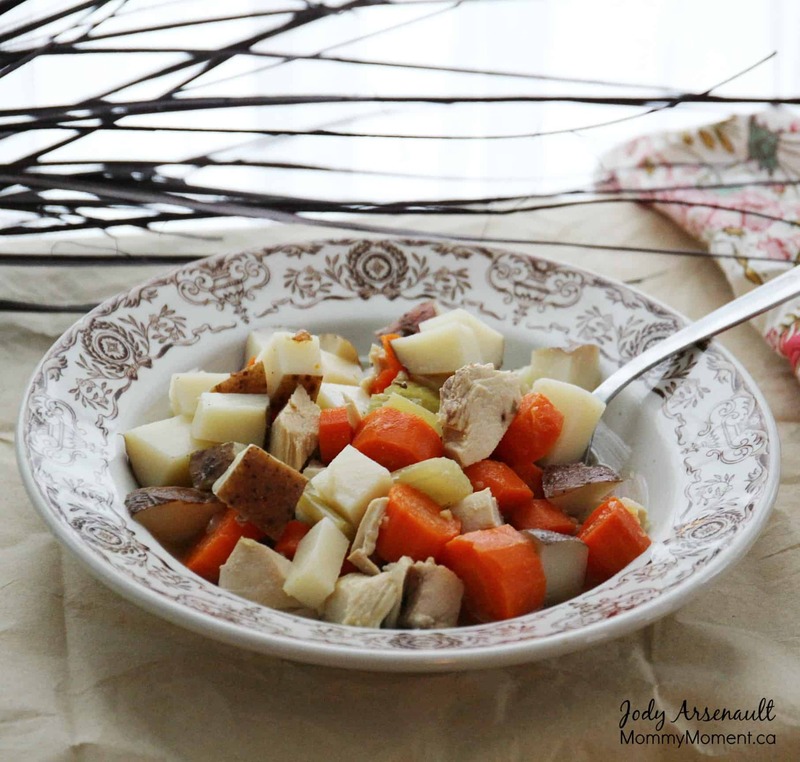 This slow cooker hearty chicken soup is one of our family favorites. It uses up leftovers from weekly roasted chicken meal. Don’t let the simplicity of this recipe fool you, it is full of flavor and hearty making it a fully satisfying meal in a bowl. I make my own homemade broth which I keep in jars in the fridge making it easy to have on hand. I also love to add a drop of thyme essential oil. 2 cups chopped potatoes (raw or leftover baked potatoes – skin on) – Optional for those following a Paleo diet. Since I follow a Paleo way of eating I leave the potatoes out of the slow cooker and just add leftover chopped baked potatoes into into my kids bowls of soup after it is cooked. This way our whole family can enjoy this delicious meal. You can sign-up to get an email update each day. Connect with us on Pinterest, Instagram, Facebook and Twitter . This sounds so hearty and filling. Perfect on a cold winter’s night. This soup looks so delicious! This might make me make some soup this weekend. Thanks for this recipe! I just pinned it. I’m going to try this next weekend…… it’ll be perfect for after skating! Mmmm! I sure love my chicken soup. 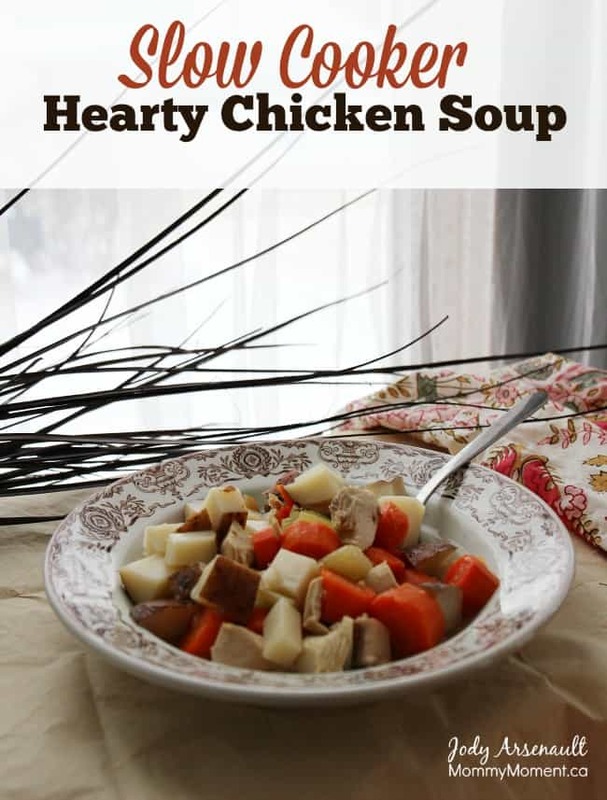 I love homemade soups and chicken soup is amongst our one of our favorites! I’ve never made it in the slow cooker before, but what a great idea! My house is in turmoil right now as we’re moving in a few days, but my slow cooker isn’t packed yet and it would be so easy to throw everything into the slow cooker and let the soup make itself while I’m so busy! This soup would be amazing to treat a cold. looks good are you allowed yellow or green beans? Id add those to mine. That would be a delicious addition. Yummy! Perfect comfort food for those cold months. I love to make my own Chicken broth to flavor any Chicken soup I make. I have had a slow cooker for years but have never tried it. I want to make meals in it as it would make meal preparation easier on some days. I think your Slow Cooker Chicken Soup would be a good place to start. I also like to put frozen peas and carrots in my soups-makes it i easier to add more vegetables. Thank you,. Jody, for this recipe. This is something I want to make soon. The cold weather is coming soon and so are colds. This would be great if you had a cold. I love using the slow cooker for meals because it is a easy way to cook and get great results. This recipe looks really good.